A SHOCKING crime wave has hit the Kircubbin area with reports of 33 local arrests by police at the weekend. The arrests follow a spike of complaints from upstanding residents claiming that money mysteriously disappeared from purses, wallets, money boxes, bank accounts — and even under mattresses — over recent weeks. News from the Police Service of Ballycran (PSB) confirmed that those arrested spent a night in Crumlin Road Gaol on Saturday before being released the following morning after posting bail of around £2,000 each. However, in a disturbing development, it emerged that the Godmother of the criminal gang was none other than Emma Keith, otherwise revered as the vice-chair of St Joseph’s GAC in Ballycran. 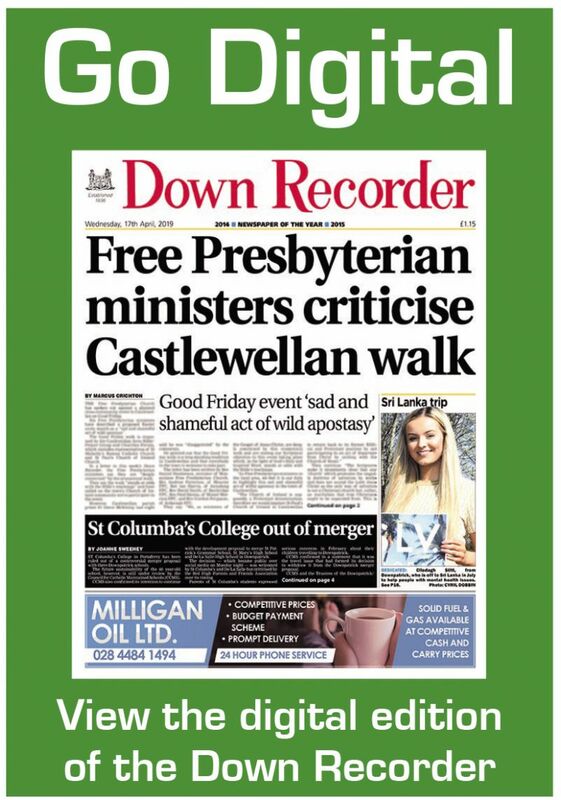 In a bid to clear her name, she exclusively revealed to the Recorder that she was part of a dedicated group of Ballycran people who were on a top-secret fund-raising mission known as the Big Project. Ballycran club chairman Shane Gilmore last night confirmed the club had indeed pulled off an amazing charity coup in its bid to raise money for its new indoor hurling pitch. Mr Gilmore said: “The Crumlin Road Gaolbreak has been a fantastic initiative for Ballycran. We were given the opportunity to run this event by Keiran Quinn, proprietor of the Mermaid Bar in Kircubbin and Crumlin Road Gaol, and realised with his help that this could be a really successful venture. “It has in fact exceeded all our expectations and perhaps more importantly, has generated a great energy and enthusiasm around our club and further afield. The Crumlin Road Gaolbreak is the McKenna Park-based club’s major fundraising initiative as it celebrates its 80th anniversary this year. The concept involves each person who is ‘arrested’ having to raise £2,000 in sponsorship in order to get themselves out of jail on bail. The club’s dedication to making the arrest experience as authentic as possible, combined with regular hilarious tongue-in-cheek newpaper and broadcast news reports over the last month, has certainly caught the public’s attention. Some PSNI Ards officers got involved in the fun on Saturday after a mock trial at McKenna Park and helped get those arrested into transport ahead of jail. Those arrested did genuinely spend the night in the cells but word has it that it was probably the best jail experience ever as the bar was open and the ‘craic’ was mighty. The final total raised will not be known for several weeks until all sponsorship money comes in. “This project needed serious investment and I suggested doing the Gaolbreak at Crumlin Road, which our company runs. Chairman Shane got involved in the conversation and I made it that clear if this was done the right way, then there was serious money to be made, from outside the club,” he said. The new facility is costing around £500,000 and has been grant-aided to the tune of £250,000 by the Rural Basic Services Scheme run from the Department of Agriculture, Environment and Rural Affairs. Further funding of £25,000 was attained from Ards and North Down Borough Council. It is hoped that it will be completed later this year and that the money raised from the initiative will reduce the amount of loan that the club requires in the future. Those who were brave and generous enough to be arrested included club chairman Shane Gilmore, ’star of the show’ 15-year-old Joe Brown, club trustee Paddy Hughes Sr and Paddy Hughes Jr.
Also taking part were club trustee Paul O’Prey, senior hurlers Scott Nicholson and Dr Andy Bell, senior camogs Deirdre McGee and Nichola Torney, Kieran Doherty and former senior championship winning hurler and senior hurling manager Gary Savage, among many others. Down and Ballycran senior camogie player Catherine McGoarty went from being a teacher to a broadcaster as she read out news of various arrests and posted them to Facebook. “Obviously all those who put their names forward to take part knew that they would be going to jail but they didn’t know when and where and that’s where we made it sneaky,” she said. Some people were literally dragged out of their homes, workplaces or from the training pitch by club members Tony Bell, Shane McCarthy and Dermot O’Prey, who were wearing realistic police uniforms. Things threatened to slightly get out of hand during the last week when the rogue Cran Action Force turned the tables on the PSB and kidnapped them temporarily. Catherine and the rest of the PRO team — Angela O’Prey, Leanne Gordon, Emma Keith, Cara O’Prey — also published the Cran Chronicles on Facebook where those arrested were mock-shamed from everything to liking rugby or allowing their son to play for another team. “Some of the stories were half-way factual but some were completely trumped up charges but they helped keep the buzz going and I think that really help everyone raise the money,” said Catherine. Ballycran GAC is organising a Gaolbreak Ball this Saturday at Crumlin Road Gaol. If anyone would like to donate, please contact gaolbreak.ballycran@hotmail.com.